The SZX7 stereo microscope features a 7:1 zoom ratio, built-in electrostatic discharge protection, and uses an advanced Galilean optical system for brilliant, highly resolved images. Ergonomic features include easily accessible microscope controls and adjustable eye tubes for comfortable viewing at an affordable price. The Galilean Optical System (0.8x -5.6x zoom range) in combination with the improved coatings used in our distortion free objective lens series with their large numerical apertures provide the optimal image for any sample at any appropriate magnification. The DFPL series accurately reproduce sample shapes with outstanding color fidelity. Apochromatically corrected to achieve the highest degree of performance, Excellent resolving power, contrast, and image flatness with minimum distortion. Well-balanced objectives that combine high resolving power with long working distance. Ultra thin and eco-friendly LED stands provide energy efficient trouble free usage. This specially designed fiber optic light source can mount directly onto the stand for a clutter free workspace. Available with single or double interlock and ring light guides, this system provides bright long-life illumination. Used with the dual flexible light guide, this illuminator provides bright, even illumination without the need for centering adjustments to the lamp. *This model may vary by geographic region. A long-lasting ring light illuminator with minimal thermal effect and superior brightness is ideal for homogeneous lighting. Curved ultra-slim stand with contoured base plates provides easy sample access while reducing stress and strain to the user’s hands and arms. For inspecting or assembling large samples, Olympus offers a variety of adjustable and ESD safe boom stands. Large platform stands are also available and, if required, can accept 400 mm and 600 mm auxiliary posts. SZ2-STU2: The arm's angle and length can freely be adjusted. SZ2-STU3: The stand is clamped on the side of a desk for assembly and inspection lines. Our full line of digital cameras are easily adaptable to the SZX7 and available as stand alone systems or PC controllable, software routines vary from simple capture to measurement, report generation and database archiving. The ergonomic long tilting trinocular provides an optimized work position by bringing the microscope closer to the user while the extendable eyepoint adjuster provides flexibility for users of different heights. The SZX2 series’ ergonomic instruments reduce stress during observation by providing the most comfortable position for each user, increasing work efficiency. The microscope body and stand feature precisely curved contours developed through careful 3D computer aided design (CAD) analysis. Key ergonomic features help reduce fatigue during periods of long observation and include an all-round finish that’s smooth to the touch. The most frequently used knobs and switches are easily accessible to maximize operator comfort and reduce back strain. 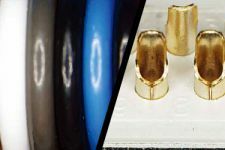 Many inspection tasks require the use of the same zoom magnification setting to ensure consistent and comparable results. The integrated click-stop mechanism provides quick and easy access to this important function. The zoom knob stopper enables the user to accurately choose their desired magnification, and the setting in use is clearly displayed on the front control panel. This Eyepieces feature a pupillary aberration control mechanism whereby the image remains visible even if the operator’s eyes move. This lessens operator fatigue during long observations. The unique eyepiece mounting design excludes dust particles and keeps the eyepiece firmly in place ensuring clear images and an ergonomic eyepiece position. All microscope bodies and accessories are ESD-safe and can discharge static electricity from 1000 V down to 100 V in less than 0.2 seconds, protecting the equipment and preventing sample damage.